This would become the start of Alexandra Avenue leading to Rayners Lane. The Swan pub. I believe that this was rebuilt during the '60s when a faux oast house was incorporated in the building. This seems to have been incorporated in the more recent housing build on the site. Members Stand & Grandstand. Two of the earliest cantilevered stands in Britain. Opened 1929. Demolished 1955. 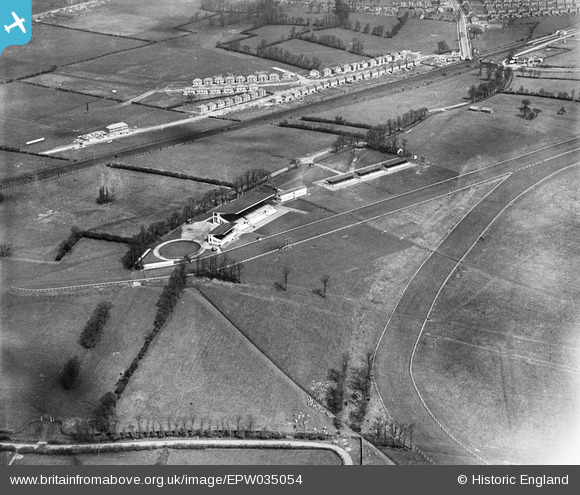 According to Simon Inglis' excellent "Played in London" Northolt Park opened 4 May 1929 and staged its last meeting in June 1940. Races were run to the rules of the Pony Turf Club, which catered for animals under 15 hands high. After wartime use a post-war enquiry allowed the site to become a housing estate with most of the roads named for racecourses. The framework for one stand was later re-erected at Brand's Hatch.